I know I am way behind all the other crafter's/cardmaker's out there in the world that have accomplished amazing creative heights...and I'm okay with that...but I just want to say that I'm having so much fun finally experiencing inking with stencils!! I'm kind of having too much fun...you know...that moment when you are really enjoying yourself and you think you will never make another card without using this technique?? So here are the cards I made using the stencil/inking process. I used Tim Holtz Distress Inks. The stencils on the right & left are Hero Arts stencils & the one in the middle is from Inkadinkado. You really just need to add a sentiment to finish them off. I loved how they turned out! Your stencil work is lovely! Glad you shared it at FMS! Great work with the stencils! Love those colours! Thanks for joining us this week at Freshly Made Sketches! 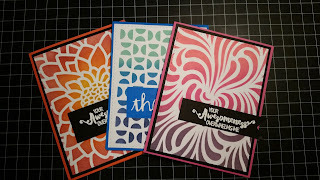 Lovely bright cards. Such lovely stencil work. 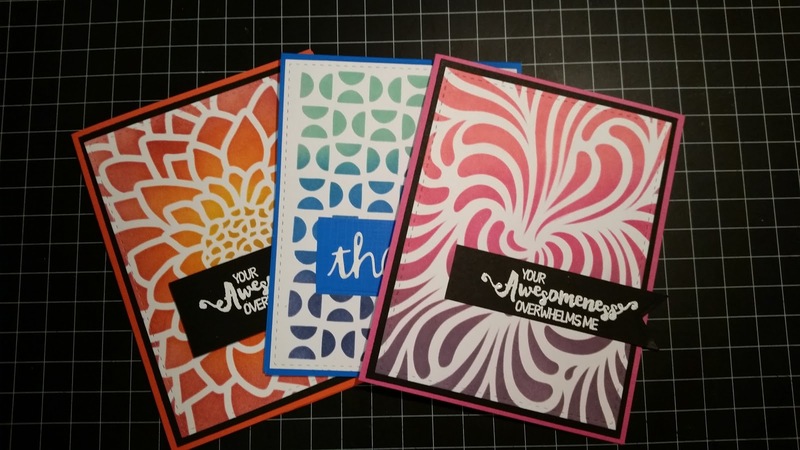 Love the vibrant colors and the bold patterns on these cards. They are sure to brighten someone's day. Lovely collection of cards. I never use stencilled backgrounds - maybe I should give them a go after seeing these! Thank you so much for joining in the Crafty Sentiments Challenge this time. Hope to see you again. These are brilliant. I have never tried this technique - may have to now! Thank you so much for joining us at Crafting By Designs. Good Luck!